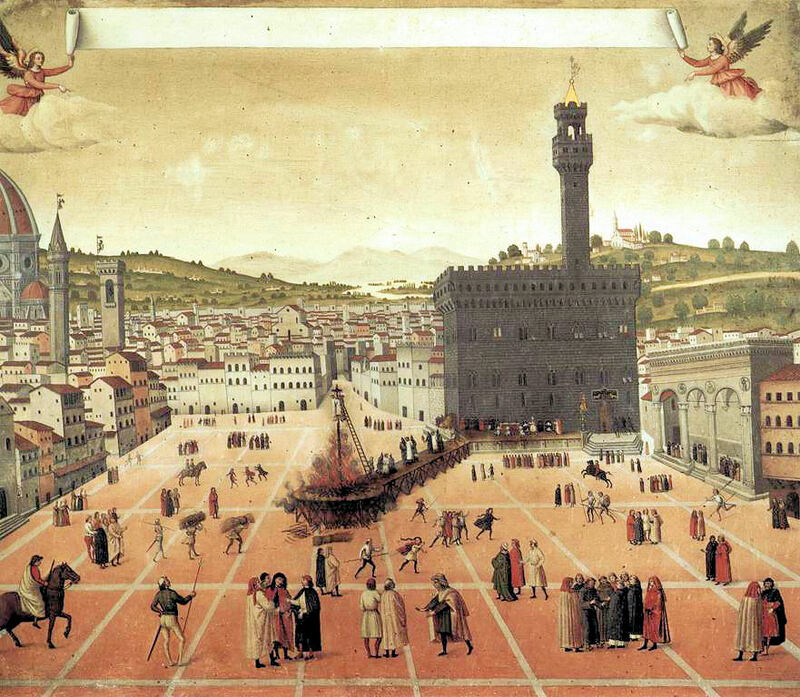 Lent is largely set in Florence and Hell, between 1492 and 1498. More than any book I’ve ever written, it needed visual referents. I always have a file of pictures when I’m writing, but this time it seemed it would be fun to share. Huge thanks to Ada Palmer — everything not labelled “Wikimedia commons” is hers. This is a near-contemporary painting of — well, what? 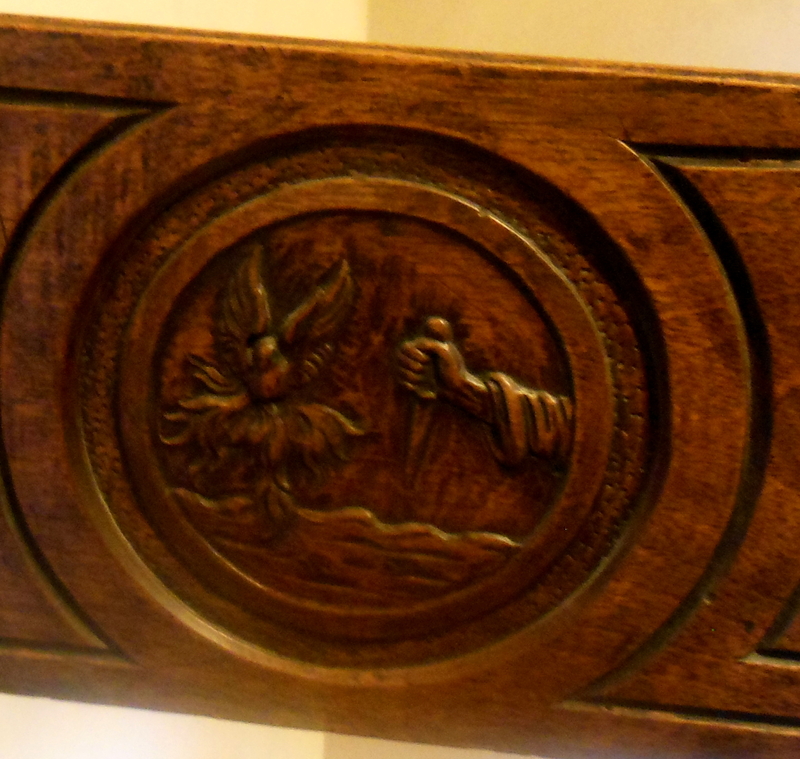 The scroll at the top, the one the angels are holding, sure doesn’t tell you. It’s like they’re up there over the event saying “I’ve got nothing”. It’s the death of Savonarola. 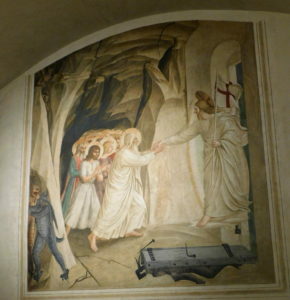 Or maybe the martyrdom of Savonarola. There’s a lot going on in there. For one thing, there are a lot of different times happening at once. The monks are confessing, walking to the stake, hanging, all at once, and the fire is burning while people are still collecting the brushwood. Very strange picture. This is a painting by an unknown Sienese artist, from the fourteenth century. It’s in the Louvre. It’s called Fall of the Rebel Angels, and the artist is known as “the Master of the Fall of the Rebel Angels”. I came across it by chance and stopped dead. 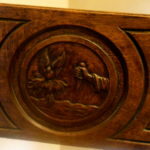 It’s amazing, both the pattern of angels turning into demons below, which is almost like Escher, and even more interestingly, the empty seats in Heaven, and the way Michael and the other archangels are patrolling the spheres. Because of the helmet and the spear and the wariness, they reminded me of WWI soldiers, and that gave me the idea of shellshocked angels. But it was the empty chairs that stayed with me most, the empty row of choir stalls. That’s where those demons used to sit. And now they don’t. 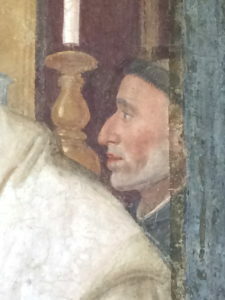 This is a fresco by Fra Angelico in one of the cells of San Marco, the Dominican monastery rebuilt by Michelozzo for Cosimo de Medici in 1437. Every cell has its own original artwork, for the monk to live with and think about. I’ve been to another period monastery that did this where the art is meh, but in San Marco they all had masterpieces by Fra Angelico, who was himself a Dominican monk in San Marco when he did them. You can see in this photo the curve of the cell wall and ceiling and how that’s shaping the painting. 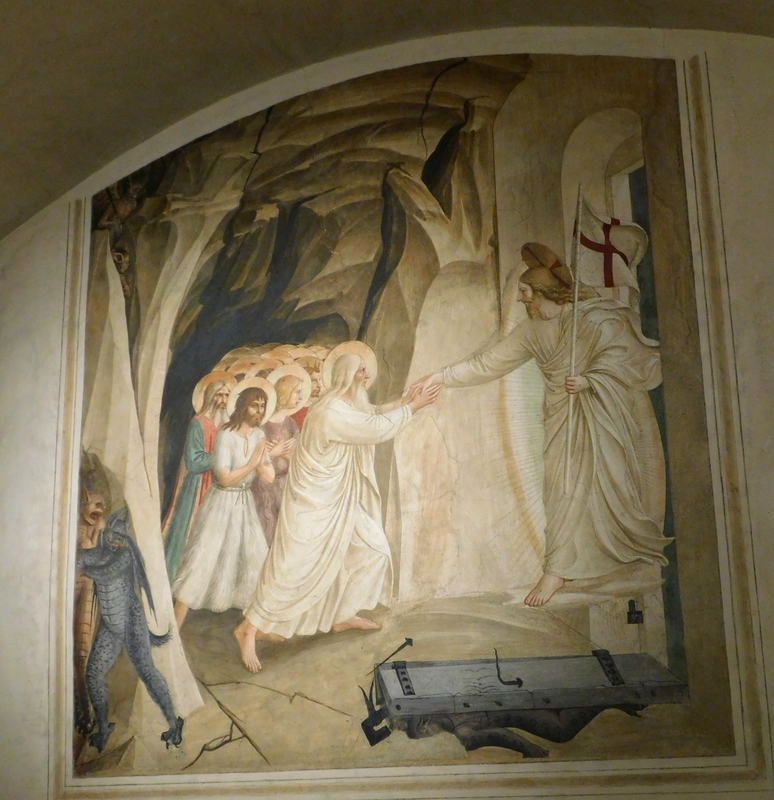 This one is the Harrowing of Hell, when Christ, in Christian mythology (by which I mean it isn’t in the bible but it’s part of Christian belief) on the third day after he was crucified, broke out of Hell and took all the good people who were there out with him. See that mass of people coming out of the dark? That’s Adam in front, and John the Baptist, and then just as mass of people going on and on. And see under the door, a squished demon? And see at the side, those two demons huddling together, hiding? I saw this picture and I thought “What would happen if one of those demons came out and reached out to Christ?” The canonical answer is that they can’t. I wanted them to. It made me think of Eliot’s Ash-Wednesday “Will the veiled sister pray for those who offend her, and are terrified and cannot surrender, and affirm before the world and deny between the rocks…” That’s a lot of where this book came from. Unknowingly I had rediscovered the idea of apocatastasis, which Origen (maybe) and St Gregory of Nyssa (definitely) had propounded, and which Pico denied to the Inquisition, that eventually all souls, even the devil, could be saved. I don’t know if Fra Angelico thought of his demons as being people with inner lives, but I certainly did. This is the window of one of those cells. 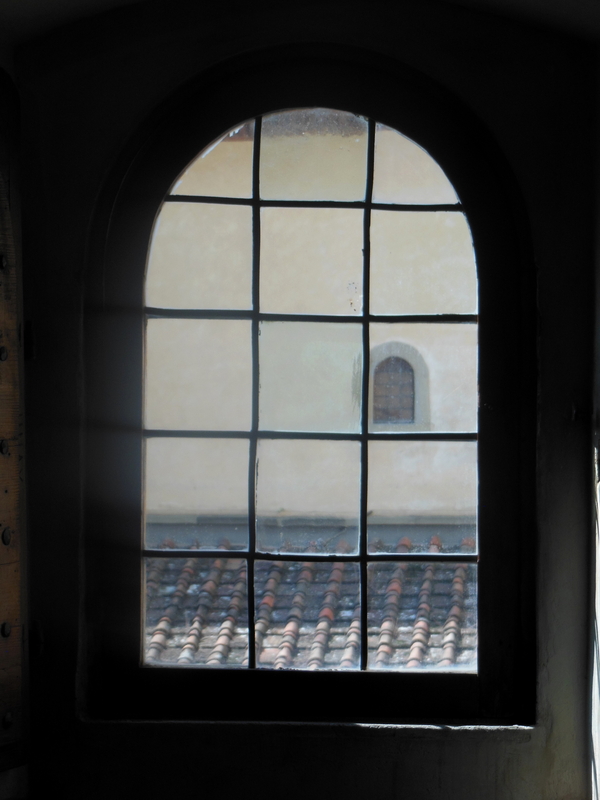 In some of Fra Angelico’s paintings, you can see windows exactly like this, so they’d have had the real window and the painted window just the same. This is a bit of the Last Supper. You can also see the well outside, which is the real well they had in the courtyard. 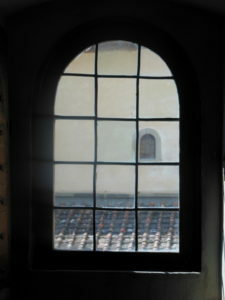 This is the view out of one of the cell windows, down into the courtyard. You can see the cell windows all around. 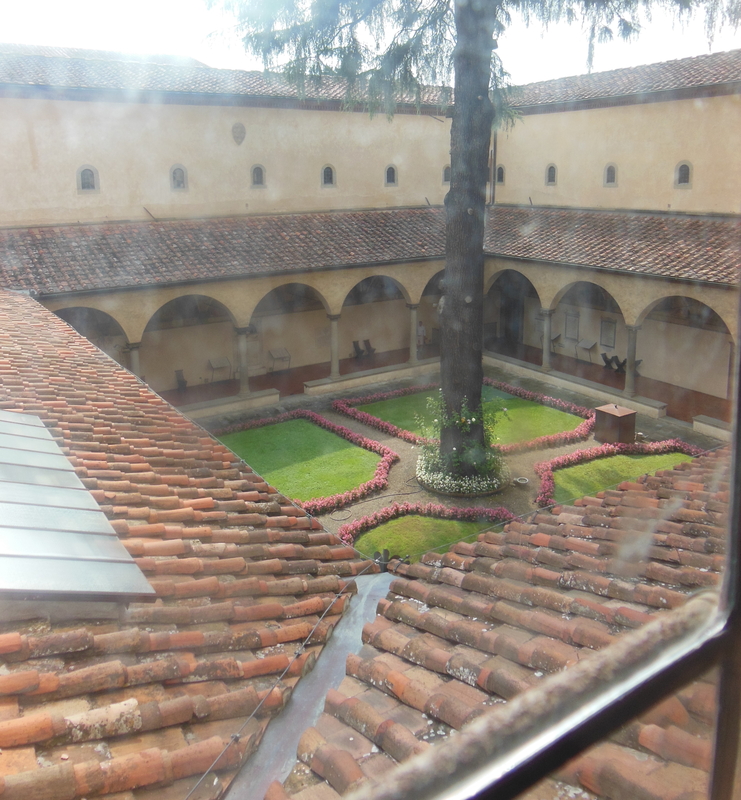 The courtyard is grass now, but it would have been growing vegetables for food. About ninety monks lives in San Marco at the beginning of the 1490s, and about two hundred at the end. They owned some farms in thr countryside which were worked for them by peasants who kept half of their crop and brought the other half to the monks. But they would also have grown some things close to hand in their courtyards. 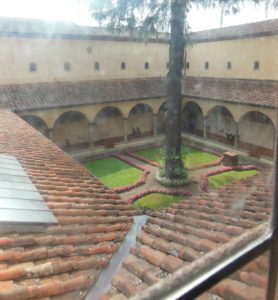 There’s a shaded cloister running around the outside, with a wall and pillars, but the middle would have been all garden. 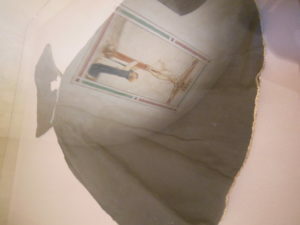 This is Savonarola’s actual habit, which is in a case under glass, and in this photo, the painting on the wall of the crucifixion is reflected inverted in the glass, which is a neat effect. 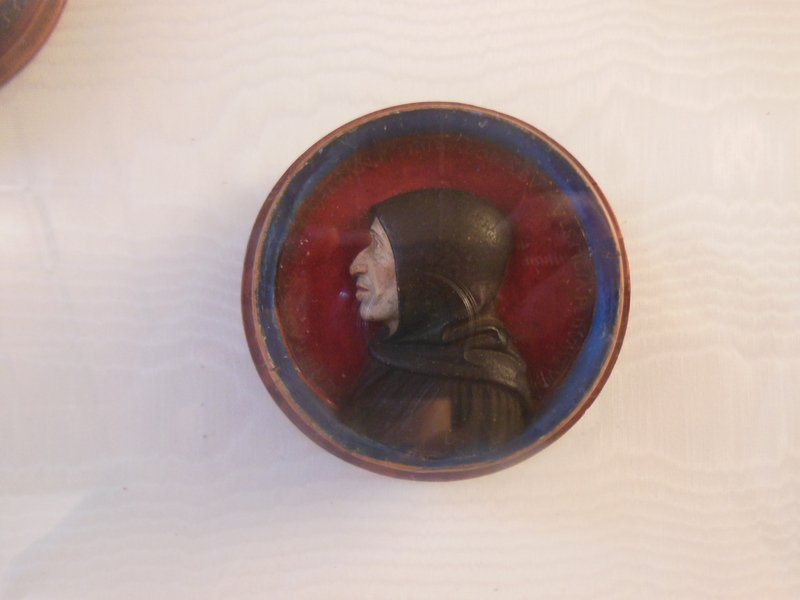 The habit is part of a collection of “relics” of Savonarola that San Marco have, despite the authorities scraping up the fire that burned his body and throwing the ashes in the Arno. There’s a burned piece of wood somebody fished out, there’s his habit, his rosary, and his hair belt. 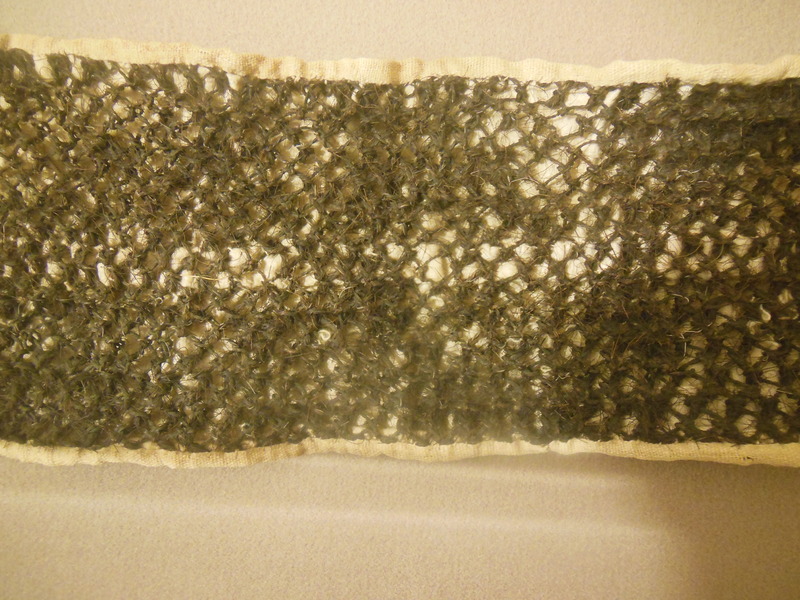 I find the idea of a hair belt horrifying — when I sweat my flesh can become raw from the bottom strap of my bra, if I don’t use enough powder, and it can be very painful, and the idea of deliberately inflicting this on yourself when any cut or abrasion could mean infection and death makes me shudder. I have a very expensive book in Italian about these “relics”. San Marco kind of doubled down on Savonarola after his death, and they’d really like him to be made a saint even now, and they’re holding on to these things just in case. 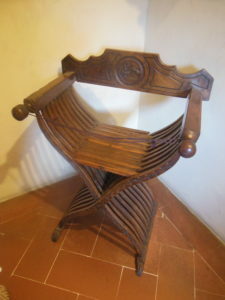 This is his chair, the chair he designed. It’s remarkably comfortable. There are lots of them in Florence, and more in San Marco than anywhere else. This particular one has the central design of his medal, the city of Florence with a sword in the air above it, one of his visions. 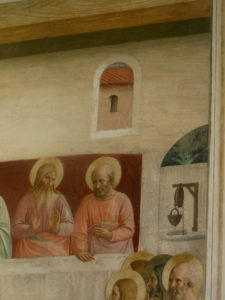 It’s in his cell in San Marco. Just a couple more pictures of San Marco. 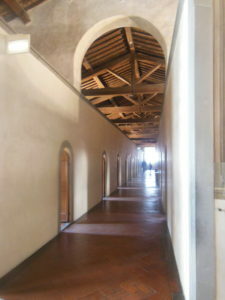 This is one of the upstairs corridors in San Marco, with cell doors all along it. Savonarola’s cell is down at the end. 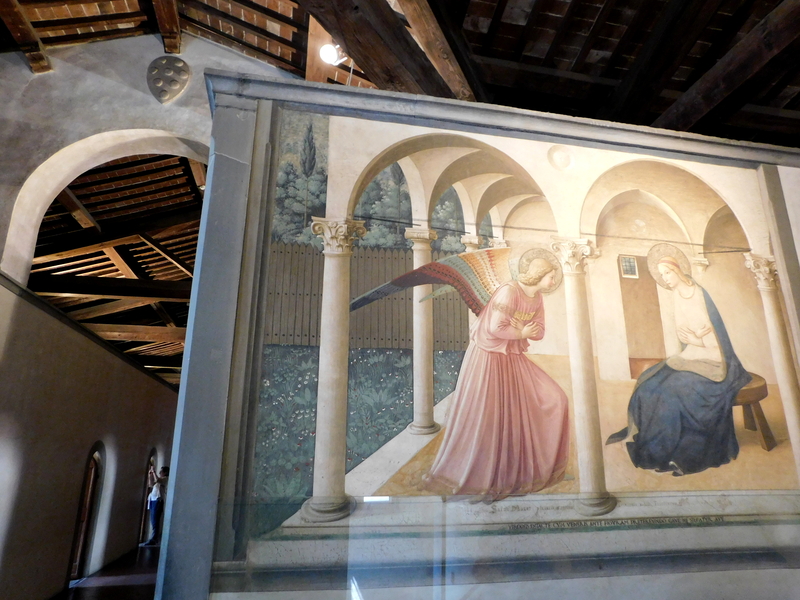 Just around the corner is Fra Angelico’s Annunciation. There are much better photos of the fresco, but you rarely see one like this that shows it in place, that gives a feel for what living there would be like a passing it every day. You can also see the Medici balls up on the wall. They’re everywhere in San Marco, from when Cosimo de’ Medici rebuilt it. Savonarola preached against putting family crests on things people paid for that were supposedly for God. 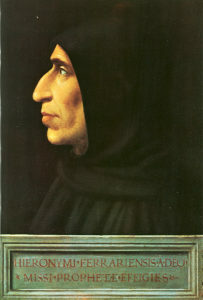 And now, some pictures of Brother Girolamo Savonarola himself. 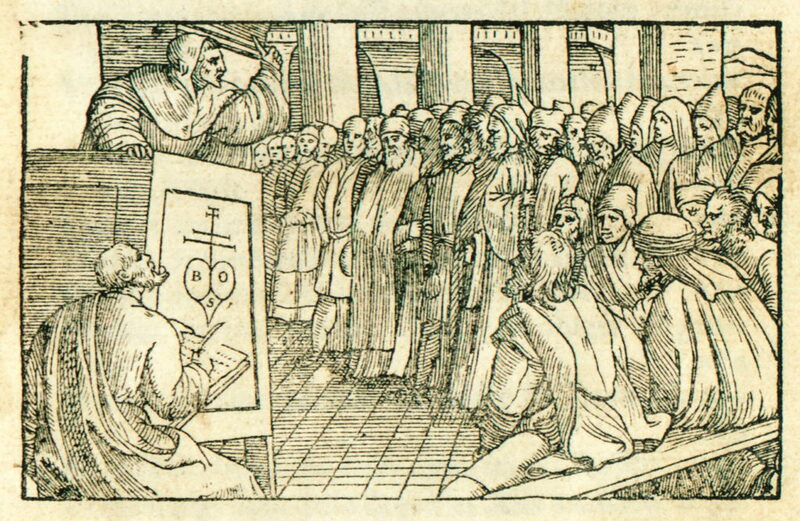 This is a contemporary woodcut of him preaching in the Duomo. I think this is from the edition of his sermons that he edited himself and worked really closely with the printer on. This is a bas relief medallion, made in San Marco not long after his death, and by people who knew him and knew what he looked like. 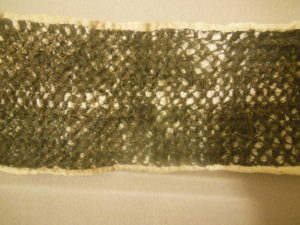 It’s slightly bigger than this thumbnail, but not all that much bigger. And this is a woodcut of his death, though you’ll notice that it calls it “martyrdom”. Works on Savonarola right up to the present day tend to take very strong positions for or against. This one is a fresco done in Santa Maria Novella for the visit of Pope Leo X in 1515. 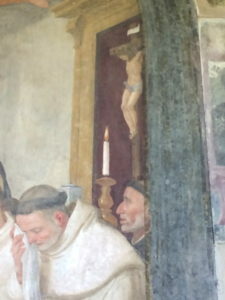 It’s part of a much larger fresco, part of repainting the whole courtyard for the pope’s visit, but they sneaked Savonarola into the background. 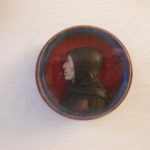 It’s possible that it was done later, because one wouldn’t expect Leo to be keen on seeing Savonarola, who was part of the process of his family losing control of Florence for fourteen years. But it’s neat that they put him in. Here’s a larger portion of the picture, where you can see that he’s standing below exactly the style of crucifix he liked. I don’t have a good photo of his own crucifix, unfortunately. And similarly, Raphael supposedly drew him into the Disputa, in Rome, though I don’t think it looks the slightest bit like him, but he was dead before Raphael went to Florence. It’s neat Raphael thought to put him in Heaven, under Pope Julius or Pope Leo, neither of whom were his friends. This one was done less than ten years after his death, almost certainly by somebody who knew him. And here is Fra Bartolomeo’s portrait of him, which is in San Marco. Fra Bartolomeo definitely knew him, he was one of his fellow monks. And this is the statue of him in San Marco. It’s late, Victorian, and it doesn’t look much like him, though note the chair. But the interesting thing about it is that it’s in front of the burial plaque for Pico and Angelo Poliziano — oh, and Benivieni, who arranged for the plaque and for himself to be buried there with his friends, after they were all gone. 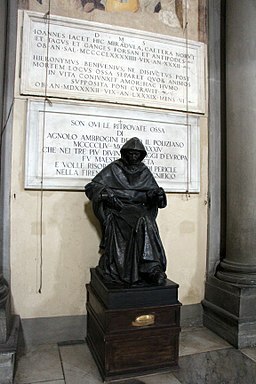 It’s interesting that they put Savonarola, who doesn’t have a tomb, there with his friends. The first time I saw this, when I didn’t know much about him, I felt that they’d put it there to prevent people seeing the tomb. I didn’t know they were friends. I was surprised when I found out. There’s a tendency for people to want stories to have heroes and villains, and in the story of the Renaissance it’s easy to make Savonarola the villain. People talk about him burning things on the Bonfire of the Vanities (and honestly, that was a lot more like Burning Man than book burning, a joyful celebration, not an attempt to destroy knowledge) and they don’t talk about him being burned as a heretic. The Church are the bad guys, and he was a mad monk, and a fanatic, and the fact he was the enemy of the pope and a friend of Pico’s gets lost. Well, that’s another thing I’m working with in this book.